In this book, a little boy is about to move from New York to Mexico City, while a little girl is about to make the same move in reverse. 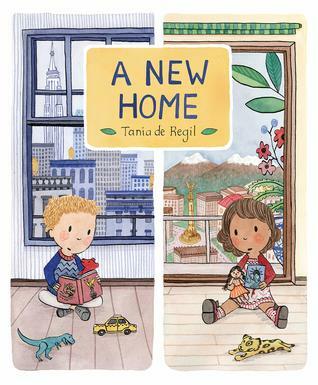 The text reflects the apprehension of both children as they wonder what their lives in their new homes will be like. As they question whether they will find friends, good food, places to play, etc. in their new city, the illustrations show each one enjoying things that the other will likely discover when arriving in their new home. The back of the book explains the landmarks shown in each picture, and gives a bit more context for the way each city is depicted. I like the way this book emphasizes the similarities between the two children and the two cities, and the fact that it mostly avoids placing the diversity into any kind of political context that would be inappropriate for a preschooler. I read it with my three-year-old, and she was a big fan! Sign into Goodreads to see if any of your friends have read A New Home. I too really enjoyed this one! An accomplished book, for a debut.